1. Find a hairdresser who is on the same page as you. You should strike up a good relationship with him/her from the very beginning. One of Australian Vogue experts says there is nothing better than mutual understanding. 2. Don’t be afraid to try something crazy . A change will do you good. 3. Bring some picture of the colour you like. A professional hairdresser will analyse your skin tone and consider if the shade is perfect for your beauty. 4. Don’t buy a pig in a poke. Ask your friends if they know a trusty hairdresser. Better to know what to anticipate. Poznaj dodatkowe słownictwo z zakresu Usługi Fryzjerskie. Sprawdź również wyjątkową serię, którą przygotowaliśmy z myślą o fryzjerach, stylistach w salonach fryzjerskich. Zbiór gotowych dialogów, wyrażeń z nagraniami. Nie ważne czy pracujesz w Anglii, czy w Polsce – bądź konkurencyjny i zdobywaj klientów zagranicznych. Jeśli jesteś natomiast klientem, w prosty sposób zrozumiesz fryzjera. A wszystko bez zbędnych nieporozumień! Poniżej przedstawiamy przykładowy dialog u fryzjera. Przeanalizuj każde zdanie pod kątem przydatnych wyrażeń. Poniżej znajdziesz tłumaczenie najtrudniejszych słów i przydatnych zwrotów, które pomogą Ci odnieść sukces w codziennej komunikacji. A: Good morning. It’s your turn now. Please have a seat on the chair. What can I do for you? B: Hello, I want to cut my hair. Not too short, I think we can do something with the ends. I would also like to change my hair colour because I don’t like it. A: OK but first I will wash your hair. Follow me, please. A: How would you like to cut your hair? B: I want to have a different hair style. Could you shorten my hair and recommend me a new hair-do with fringe? A: Surely! Look over this catalogue. Maybe we will find some inspiration How about this one? B: Oh, I love it. It looks trendy. A: Perfect. What about the colour? I have this colour chart so you can choose from here. B: Well, I think I will go for chocolate brown. A: Good choice! Do you prefer highlights or subtle reflexes? B: I suppose reflexes will suit me better. A: I agree, it’s going to be more natural. Let’s start. A: How do you like it this way? A: OK, I will set your hair now. 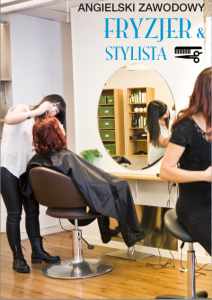 Would you like a straight and blow-dried hairstyle? B: Yes, please. I’m going to a very important meeting so I need to look captivating. A: I’m sure everyone will see your new hair-do. B: Well done! How much do I pay? A: That will be 200 zlotys. Do you need any hair-care cosmetics? B: I’m in a hurry now but I will come tomorrow. A: See you then. Have a nice day. What can I do for you? – W czym mogę pomóc? How about this one? – A może ta (fryzura)?